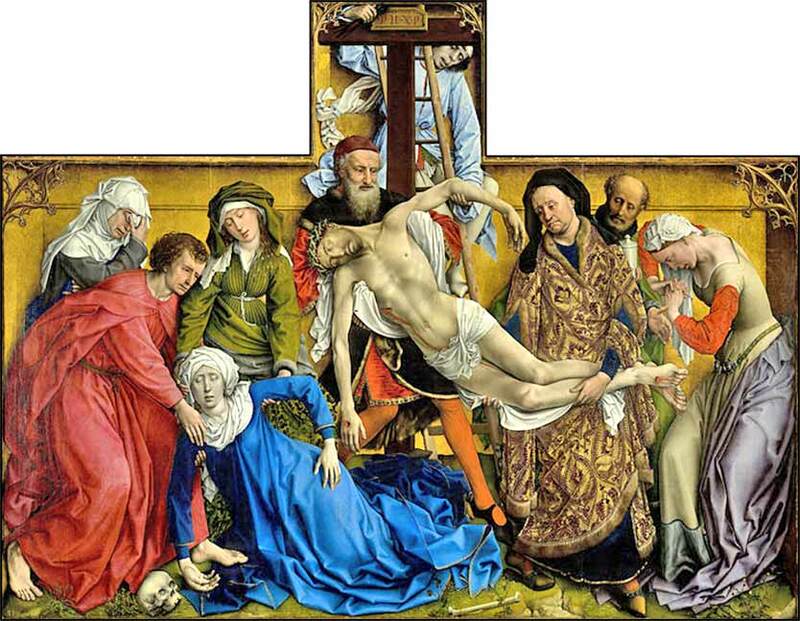 The Disposition by Roger van der Weyden, ca. 1435. Almighty God, as I cross the threshold of this day, I commit myself Your care. Mold me in your image. In everything I say and do, let my mind be on the eternal goodness of heaven rather than the vanities of earth, meaningless pride, or the anger and envy that tear apart my precious soul. 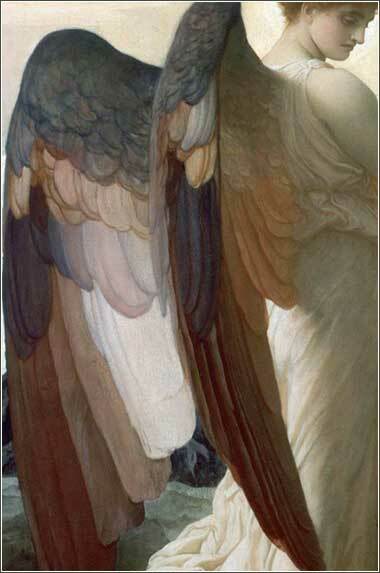 Elijah in the Wilderness (detail) by Frederic Leighton, ca. 1878. 21-24 I am not saying that the Law is contrary to the promises of God. Not at all. But if the Law had power to give life, then it would have resulted in righteousness, and it did not. What it did was to confine together and guard those who followed it, showing them to live in sin. It was our disciplinarian, our tutor, until the promise by faith would be revealed in Jesus Christ, given to us so that we would believe. 21 Then the law contrary to the promises of god? Definitely not, for if was given law the having-power to give life, actually from law would have been righteousness. 22 But confined mPoss. shut up together. The word is used of a single person put in prison, but its components use a prefix normally meaning “together”. That would be appropriate here, reflecting the limited and well-defined group who received the law. Or, it might stress the completeness of a surrounding wall, enclosed on all sides. the scripture nLit. the writing. the entirety under sin that the promise by faith of oOr of, or from, etc. Another instance of the pistis Xristou ambiguity. Jesus Christ might be given to the believing. 23 For before to have come faith under law we were being guarded pOr being shut out from (the faith by the law). An ambiguity exists as to whether the law guarded us in a protective sense until the time for faith to be revealed, or imprisoned us in the sense of excluding us from true faith. The NASB and KJV use the latter reading, but it might be preferable to leave the ambiguity intact, as many others do. being-confined until the coming-soon faith to be revealed. Paul reaches a point in his argument where, having spoken so negatively about the Law of Moses, it might give the impression that he disdains it. He is arguing against “Judaizers” — Jewish Christians who are teaching that circumcision and compliance with all of the tenets of the Law are part of Christianity, that they must be followed in order to attain salvation. So naturally, he has argued about what the Law cannot do. He has shown its limitations, the areas in which it is not effective, and parts of it that were so completely fulfilled by the final sacrifice of Christ on the cross that they are moot. The Law of Moses, although it had a specific purpose and did not supersede the previous promise made to Abraham, was nevertheless the Word of God. Every single word of it, down to the tiniest bit, is absolute truth. But the law is confusing to modern Christians; much of it is incomprehensible, shocking, or even rather silly-sounding. Much of it was fulfilled by Christ, and we no longer pay attention to it except out of historical interest; much of the rest of it was explained, transformed, or modified by Christ. There is considerable confusion among Christians, not only as to which parts of the law we are obligated to follow, but also concerning the degree to which we must try to follow it and the impact sin might have upon our salvation. These are two enormously important issues, but require more discussion than is appropriate during our study of Galatians. So, after we finish our current segment on Galatians, we might tackle one or both of these subjects before moving on to 1 Corinthians. Paul is not so interested in how the Law should continue to be followed, in these verses, as explaining how God intended the Law as a whole to operate in the ultimate salvation of humanity. He reiterates the most basic shortcoming of the Law: it cannot give life. Despite this shortcoming, though, it cannot be contrary to the promise God gave Abraham. God's Word is always truth, and the Law was undoubtedly God's Word. He illustrates the operation of the Law by tying it into his teachings (in the verses immediately preceding) about an heir, who is subject to a guardian when he is young (and therefore like a servant), but receives his inheritance when he reaches the age his father has determined. Humanity is such an heir. Thus, we were ruled by a guardian until the time came for us to receive our inheritance, the time set by the Father. The Law, Paul tells us, was just such a guardian. It ruled over us while we were children; it was our disciplinarian. It taught us right from wrong by punishing us (which is to say, the Hebrews) for our transgressions. An analogy to modern life might help clarify his meaning. After we graduate from high school, both the conduct and the knowledge our teachers taught us is still correct. It is still wrong to disrupt assemblies, and 2 + 2 still equals 4. The teachersThis is by means of an imperfect analogy. The words Paul uses about guardians do not refer to people who teach subject matter like reading, writing, and ’rithmatic, but rather, solely to those who oversee the general life and discipline of a child. and the high school itself, however, no longer have any authority over us. Similarly, after the coming of Christ, we became co-heirs and thus were no longer subject to the authority of the Law; but this does not mean that the teachings of the Law became incorrect.